Reading Siddhartha Mukherjee’s The Gene: An Intimate History (NY, NY: Scribner, 2016; paperback, 2017) is to take a 150+ year print journey with an English-speaking physician and scientist, who is also a renaissance man. Mukherjee, an assistant professor of medicine at Columbia University, won the Pulitzer Prize in 2011 for his non-fiction work, The Emperor of All Maladies: A Biography of Cancer. I have not read that earlier work, but have spent time delving into The Gene. 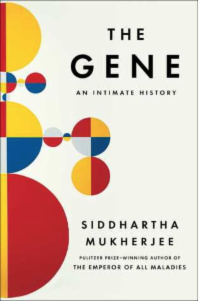 The Gene: An Intimate History begins with the author’s 2012 trip to Calcutta with his father to visit a cousin afflicted with schizophrenia. Moni’s diagnosis of mental illness, along with that of two other paternal relatives, is one of many threads woven throughout this work. After a brief introduction to the “intimate” portion of this journey into the gene, the author reaches back to the beginning of genetics – to a man who repeatedly failed science exams. That unlikely father of genetics, an Augustinian monk, did know something about animals as well as gardening. He bred mice in his room, but the abbot was less than pleased. The author describes the abbot: “He drew the line at mice, but didn’t mind giving peas a chance.” Humor is perhaps the last thing one would expect from a book on the gene, but Mukherjee is not above puns. He highlights the fact that, like the atom and the bit/byte, the gene is a basic unit. The discernment of each of these elementary entities was rapidly followed the exploitation of same. From Darwin to Galton, and on to eugenics in Britain, the United States, and Germany, the author tells the story, not shrinking from the repugnant details. On to the recounting of the discovery of deoxyribonucleic acid (DNA) and its associated ribonucleic acid (RNA), and their coding of proteins or regulatory functions, the history is unfolded with amazing breadth and detail. Mukherjee embraces much of Darwin’s evolutionary theory: “In nature, the engine that drives genetic alteration has no one in its driver’s seat” (421). Yet he is appreciative of the inherent beauty of DNA’s molecular structure, calling regulation, replication, and recombination, the “3 R’s of gene physiology”(182). Watson and Crick’s double helix uses “ingenious variations on the same theme. Mirror-image chemicals are used to generate mirror-image chemicals, reflections used to reconstruct the original. Pairs used to maintain the fidelity and fixity of information” (183). The author is enthralled with reality.
. . . This . . . . is . . . the . . . . . . , , , . . . . . . . struc . . . ture , . . . . . .
of . . . Your . . . . . . Gen . . . ome . . .
As before, the words in the sentence correspond to the genes. The ellipses and punctuation marks denote the introns, the intergenic regions, and regulatory sequences. The boldface and capitalized letters and the underlined words are epigenetic marks appended to the genome to impose a final layer of meaning (402). The Gene poses a number of questions for the reader to contemplate. One of the more important is near the end of the book. If the history of the last century taught us the dangers of empowering governments to determine genetic “fitness” . . . then the question that confronts our current era is what happens when this power devolves to the individual. It is a question that requires us to balance the desires of the individual – to carve out a life of happiness and achievement, without undue suffering – with the desires of a society that, in the short term, may be interested only in driving down the burden of disease and the expense of disability (461-2). From a moral standpoint . . . achieves a seeming impossible sleight of hand. If you selectively implant the “correct” embryos and cryopreserve the others without killing them, you can select fetuses without aborting them. It is positive and negative eugenics in one go, without the concomitant death of a fetus (456). The fact that embryos may die, or languish in a frozen state, is apparently of no concern. Why the author gives moral standing to the fetus but not to the embryo is never explicated. to know that the notes should be divided, and why.